(Millions) Source: FAO Statistics Division, Food security database Note: The composition of developing regions follows MDG UN regional classification ; an additional 115 million people are suffering from hunger as a result of the combined impacts of rising food prices and the global economic recession. Two recent prices spikes have shown the limitations of the global food provisioning system. In 2007–2008, commodity prices doubled, and the estimated number of hungry people topped one billion, while food riots spread through the developing world. 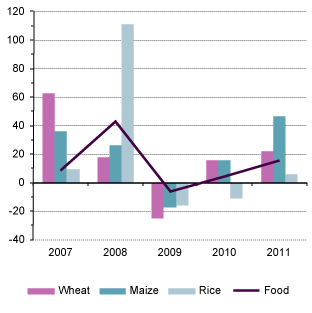 In 2010–2011, food prices increased again by 21 per cent. The absolute number of undernourished The FAO measure of food deprivation, which is referred to as the Prevalence of undernourishment, is based on a comparison of usual food consumption expressed in terms of dietary energy (kcal) with certain energy requirement norms. morepeople in the world has been on an upward trend since the mid-nineties. While the proportion of undernourished people has been more or less constant, it has risen sharply owing to the food and financial crises. In 2009, undernourished people accounted for 18 per cent of the world population. 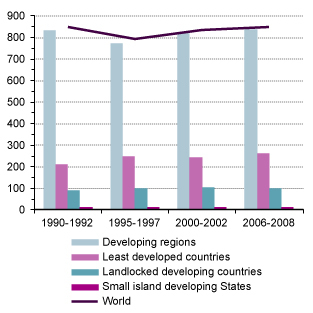 Further, the 2007–2009 crisis has had a different impact on developed and developing countries, with the least developed countries being affected the most. Around 98 per cent of the world’s undernourished people live in developing countries According to the Food and Agriculture Organization of the United Nations, two thirds of the undernourished live in seven developing countries: Bangladesh, China, the Democratic Republic of the Congo, Ethiopia, India, Indonesia and Pakistan. The prevalence of undernourishment varies significantly from region to region, with sub-Saharan Africa heading the list with around 30 per cent of the population, followed by Asia with 16 per cent and Latin America and the Caribbean with 10 per cent. In the developed world, most people were able to deal with the crisis reasonably well as a result of well-functioning safety nets; however, people in many relatively poor import-dependent countries, especially in Africa, experienced large price hikes that had permanent effects on their future income and their ability to escape poverty. Small farmers and poor consumers are extremely vulnerable to poverty as a result of unstable commodity prices. It is important to note that food represents a large share of farmer income and also a significant share of the budget of low-income consumers. As a result, big changes in food prices have a large negative impact on the real incomes of small landholders and poor families. For that reason, even temporary reductions in prices for farmers or price hikes in prices for consumers can cause permanent effects on income, leading to poverty traps. 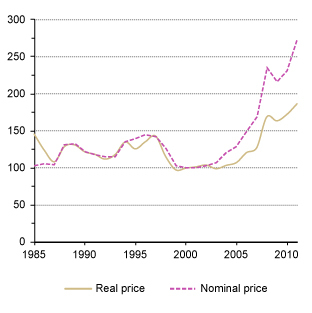 (Year-on-year price change in percentage) Source: UNCTAD secretariat calculations, based on UNCTADstat Commodity Price Statistics . Further, climate change, leading to increasingly frequent natural disasters, the growing connections between energy and food markets as a result of the rising demand for biofuels, and the increased financialization of food and agricultural commodities seem to indicate that price volatility will remain an important problem in the near future. In addition, the fundamental causes of relatively high prices seem to persist; in particular, consumer demand in rapidly growing economies will increase, and the population continues to grow. On the supply side, challenges must be met to deal with the increasingly scarce natural resources in some regions, as well as declining rates of yield growth for some commodities. In addition to high and volatile food prices, some countries are more vulnerable than others to undernourishment and recurrent food shortages. People in countries that are in protracted crises are more vulnerable to hunger. According to FAOFood and Agriculture Organization of the United Nations, protracted crisis situations are characterized by recurrent natural disasters and/or social conflict, the longevity of food crises, the breakdown of livelihoods and insufficient institutional capacity to react to the crises. One way FAO identifies countries in protracted crises is by the proportion of humanitarian assistance received by the country as a share of total ODA official development assistance . If a country has received 10 per cent or more of their ODA as humanitarian aid since 2000, then it is classified as being in a protracted crisis. Somalia, for example, one the 22 countries on FAO’s list of countries in protracted crisis has received as much as two thirds of its ODA as humanitarian aid. Investment in agriculture remains the most decisive instrument to promote sustainable long-term food security. Such investment has the potential to improve the competitiveness of domestic production, increase farmers’ profits and make food more affordable for the poor. Safety nets are also crucial for alleviating food insecurity in the short term, as well as for providing the basis for long-term development. Additional measures would include limits to biofuels expansion as it is clear that this was one of the key factors behind rising agricultural commodity prices. The high levels of price volatility must also be addressed, by increasing financial regulation to curb speculation in commodity markets. Finally, food reserves are needed to cushion price swings. Investment in agriculture remains the most decisive instrument to promote sustainable long-term food security.